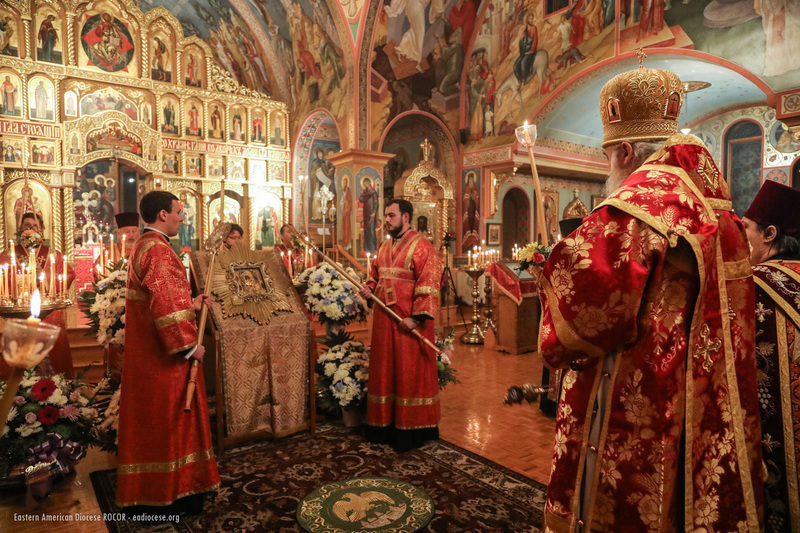 On Sunday, December 17, the feast day of the Holy Great-Martyr Barbara, celebrations were held at St. Alexander Nevsky Diocesan Cathedral in honor of the 90th birthday of the cathedral’s pastor emeritus, dean of New Jersey, and president of the Synodal Arts & Architecture Commission, Protopresbyter Valery Lukianov. 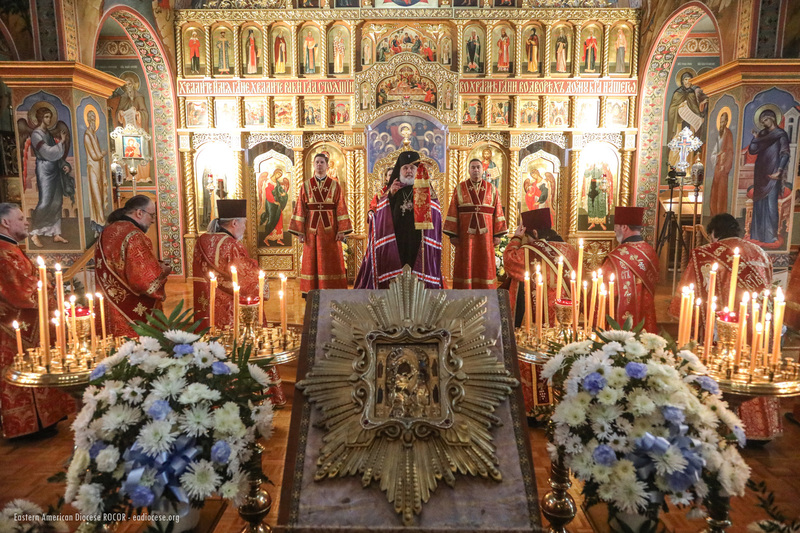 The eve prior, the wonderworking Pochaev Icon of the Mother of God, renowned throughout the Russian Diaspora, was brought down from Holy Trinity Monastery in Jordanville, NY, accompanied by monastery clergy, seminarians, and members of the seminary choir. The festal All-Night Vigil and Divine Liturgy were celebrated by Archbishop Gabriel of Montreal & Canada. His Eminence was co-served at Liturgy by Fr. Valery, cathedral dean Archpriest Serge Lukianov, Archpriests Michael Taratuchin (rector of St. John of Kronstadt Memorial Church in Utica, NY), Petro Kunitsky (cleric of Holy New Martyrs & Confessors of Russia Church in Brooklyn, NY), Boris Slootsky (cathedral cleric), Vasily Raskovskiy (diocesan cleric), and Rafael Melendez (Albanian Orthodox Church), and Peter Heers (professor at Holy Trinity Seminary), Abbots Eutychius (Dovganyuk; diocesan cleric) and Cyprian (Alexandrou; cleric of Holy Trinity Monastery), Archpriests Athanasios Kyritsis (Orthodox Church of Greece), Seraphim Chemodakov (cathedral cleric), Protodeacons Joseph Jarostchuk (cleric of St. John of Kronstadt Memorial Church), Stephen Howanetz (cleric of St. John the Baptist Cathedral in Mayfield, PA), Nicholas Lukianov, Leonid Roschko, and Paul Drozdowski (cathedral clerics), and Deacons Michael Pavuk (cleric of St. John the Baptist Cathedral in Mayfield) and Sergei Kosov (cleric of Holy Trinity Monastery). The church was filled with worshippers, who had come from various states to congratulate Fr. Valery and wish him good health and many years of life. Upon completion of the service, a multitude of the faithful communed of Christ’s Holy Mysteries from three chalices. Letters of congratulation on his jubilee were sent to Fr. 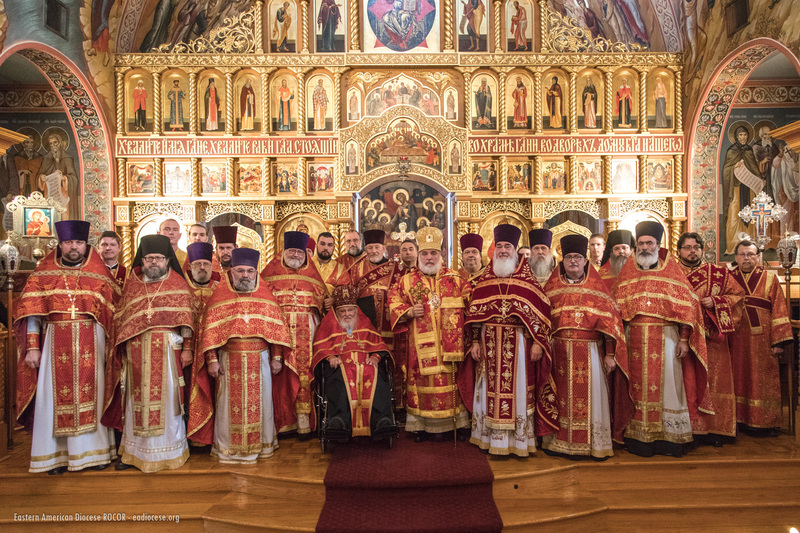 Valery from the Primate of the Ukrainian Orthodox Church, Metropolitan Onufry of Kiev & All Ukraine, and the First Hierarch of the Russian Church Abroad, Metropolitan Hilarion of Eastern America & New York, who was performing an archpastoral visit to the Diocese of Australia & New Zealand. "Your entire life has been a fiery flame of the spirit, which has traversed the furnace of many deprivations and temptations," Metropolitan Onufry wrote in his greeting (Russian). "But, despite the thorns that grew up on your life’s path, you clearly saw before you God’s light and truth, which instructed you and led you to the place of His glory – to the holy church, in order to stand at the Lord’s altar. Having grown up under the spiritual leadership of holy and divinely wise pastors, you have revealed yourself in all things as a minister of God, in much patience, in afflictions, in necessities, in distresses (II Cor. 6:4), prepared, as a true pastor, to lay down your life for the sheep entrusted to your care." Metropolitan Hilarion’s greeting (Russian) reads, in part: "In the present moments of celebration, I find it right and proper that your many years of service to the Russian Church Abroad are worthy of emulation and honorable recollection because, for the clergy around you, you have been a faithful guide and helpful leader, a merciful and condescending superior, at the same time attentive and vigilant; for your flock, you have truly been a good shepherd. But, serving the Church for many years, you did not limit yourself solely to the fulfillment of your pastoral duties; your work touched also on other institutions. Hardly one significant event for our Church took place without your active participation." Fr. Valery became rector of St. Alexander Nevsky Church in 1968. It was not long at all before he, an engineer in his prior, civilian life, took to overseeing the construction of the grand cathedral. Congratulating the cathedral’s pastor emeritus, Archbishop Gabriel called Fr. Valery "a link joining the current generation to the old school of the Church Abroad." "Fr. Valery came to the America from Shanghai, where he knew the Holy Hierarch John of Shanghai, from whom he would later receive diaconal tonsure in New York, and I would not be mistaken in saying that today you are the last cleric ordained by St. John… And so, for 50 years now, you have labored here as rector, leader, true pastor, and spiritual father. Positive memories of you remain in the Holy Land, as well, when you were sent there by the Synod and led the Russian Ecclesiastical Mission. "An enlightener and educator, you are the author of many books, having dedicated your writing talent to the perpetuation of St. John of Shanghai’s memory. You possess the spirit of a truly Russian pastor, and continue to labor even to this very day, despite the Lord having sent you trials and illness." Archbishop Gabriel wished Fr. Valery spiritual and bodily strength, along with longsuffering in his travails, that he might continue to labor to the best of his abilities for the benefit not only of the Church Abroad, but for the entire Russian Church. Fr. Valery thanked the clergy and all those who had gathered to congratulate him on his jubilee: "All of you are my children. I have counseling and buried many, sent people off to war, and I have always had the constant connection of a father with his children. It was this connection that upheld me all these years." 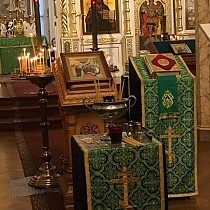 The protodeacon intoned the Polychronion for the Primates of the Russian Church and the Church Abroad, Fr. Valery, Matushka Irene, and the namesday celebrants. 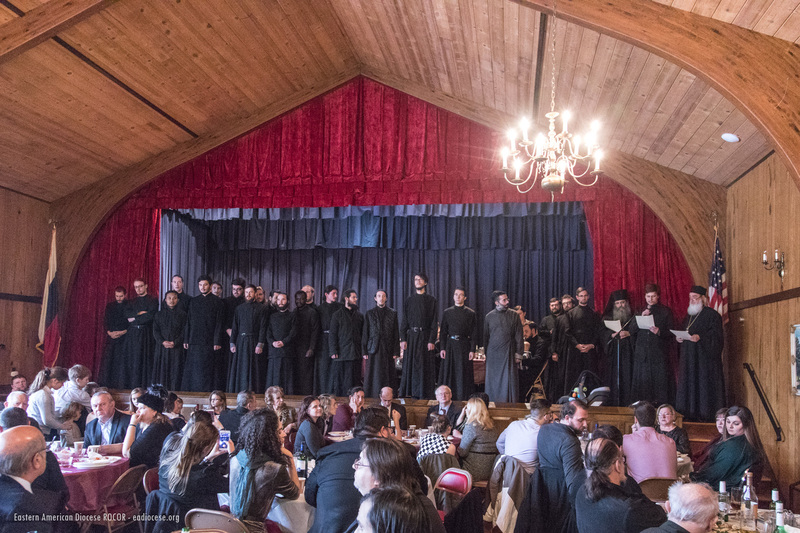 In the church hall, the cathedral sisterhood prepared a festal luncheon, which was well attended and saw the continuation of informal discussion between the clergy and faithful, who came to offer their sincere congratulations and well-wished to Fr. Valery. 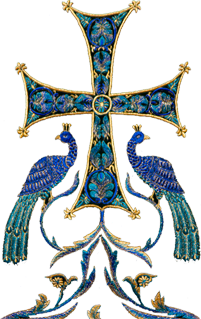 Greetings were read aloud from Archimandrite Luke (Murianka; abbot of Holy Trinity Monastery) – text here – and Archpriest Alexander Webster (dean of Holy Trinity Theological Seminary) – text here. Gathering together on stage, the seminarians greeted Fr. Valery. Expressing his joy at this new generation of Orthodox clergy, Fr. Valery thanked the young men for their attendance, and presented them all with a copy of his book, Blessed Pastorship. Fr. Valery shared some thoughtful remarks with those present, which will are available here, along with video clips from Vigil and Liturgy.